Gozitan athletes are lamenting the lack of adequate facilities to conduct their training and they’re urging the authorities to provide them with decent venues where land and aquatic sport can be practised as at present there are none up to standard. Earlier this month, the Times of Malta headed to the sister island and met a group of triathletes who spoke about their difficulties due to the lack of a track and field facility and an indoor pool. 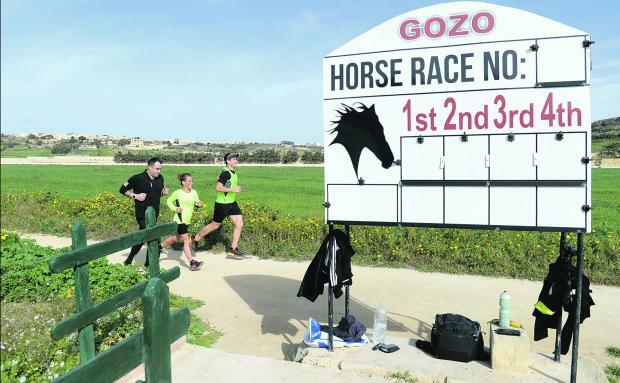 At present, runners in Gozo hold most of their sessions at the horse racing track in Ta’ Xħajma, Xewkija, where they use the inner part of the venue which consist of a very narrow lane that suffers damage after heavy rainfalls. Michael Bongailas is an avid Tri-Gozo Club member who also conducts regular training sessions for young triathletes at Ta’ Xħajma. “Unfortunately, the only training venue available for us is this horse racing track in Xewkija,” he lamented. Without the racetrack Gozitan sportsmen/women would have no other place available for training but the venue was only projected to cater for horse racing. “Obviously, we encounter a few problems here as the space available is not enough. Many times we end up splitting the group,” Bongailas said. “Added to that it’s not the safest place to hold training sessions as we have to be very careful when crossing the track especially when there are horses also galloping down the track. The Gozo College in Rabat is equipped with a 200 metres running track. However, the venue is not open for public use. “It’s a pity that we cannot use the Gozo College track which also happens to be in a very central area,” Bongailas, the first Gozitan to complete an Ironman, in Holland, last summer, said. The Times of Malta sent questions to the Ministry for Gozo (MGOZ), asking why no adequate training facilities were available. In its reply, the ministry said a number of developments are in the pipeline. “One of the projects will be a one kilometre walking/jogging and cycling trail within Ulysses Grove,” the ministry said. It is understood that the project was earmarked to be completed in 2018. However, so far works have yet to start. Swim sport enthusiasts, too, have no indoor facilities to practise with the only venue available being a 12-metre pool at the Fondazzjoni Arka which is mostly used for rehabilitation purposes. Bongailas says the Tri-Gozo Club are forced to schedule most of their training programmes during school holidays and they have to cross the channel to do that at the National Pool in Tal-Qroqq. “When the children are on holidays we head to the National Pool and hold training there,” he said. We badly need to have our own indoor pool in Gozo and we only hope that our appeals will be heard by the authorities. I think Gozitan people deserve better than this for sure. Gozitan Felicienne Mercieca shows great dedication to reach her sporting objectives. She wakes up earlier than usual three times a week and heads to Tal-Qroqq for training with her fellow Maltese triathletes. Mercieca said: “I wake up at 4am, take the 5am ferry to Ċirkewwa and arrive in time for my 6am session with coach Fabio Spiteri at the National Pool. When training is over I head back to Cirkewwa to catch the 8.15am ferry and off to my workplace. Waterpolo club Otters SC have for years been pushing to have an indoor pool in Gozo. “The construction of an indoor pool has been an electoral promise of both political parties for several years but unfortunately, none of them has made it a priority,” Enzo Dimech, Otters SC president, told Times of Malta. “The need for an indoor pool here is growing much faster than thought as there is an increasing number of young people who are showing interest in our sport. “Last year, the Gozo Sport Board unveiled plans to build an indoor pool and an agreement was in place with a private company to initiate the project. Dimech said Otters SC only install their pitch equipment and goalposts at Marsalforn during the summer months. Even then, bad weather and rough seas cannot be contained, meaning damage to the property and financial losses. “It’s not the first time that during the summer our facilities are completely wrecked by the high waves,” he said. “The breakwater in Marsalforn suffered significant damage a few years back and since then no repair works were done. So, our club is always subject to suffer damages all year round. 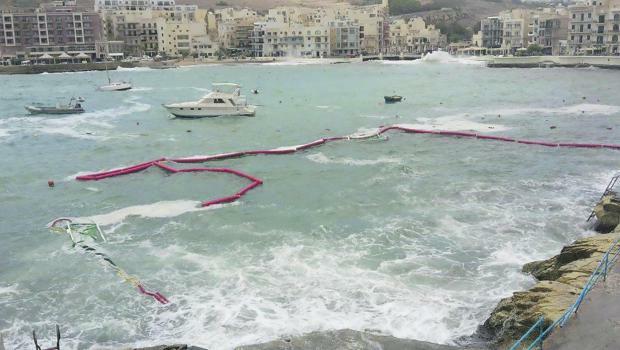 Like other water-related sports organisation, Otters SC have to conduct their winter training in Malta. “At present, our waterpolo first team holds their pre-season training at Tal-Qroqq,” Dimech said. “This year, our U-13 team will compete for the first time in national competitions. We want them to be fully prepared for the match so we have them travelling to Malta on Saturdays to get acclimatised with the new surroundings of the National Pool when competition will be played. The Otters ASC waterpolo pitch suffers significant damage when stormy weather hits Marsalforn Bay.